La Maison Jolie: A Surprise Feature on 50 Best Interior Posts of 2015 by AMARA Interior Blog Awards! 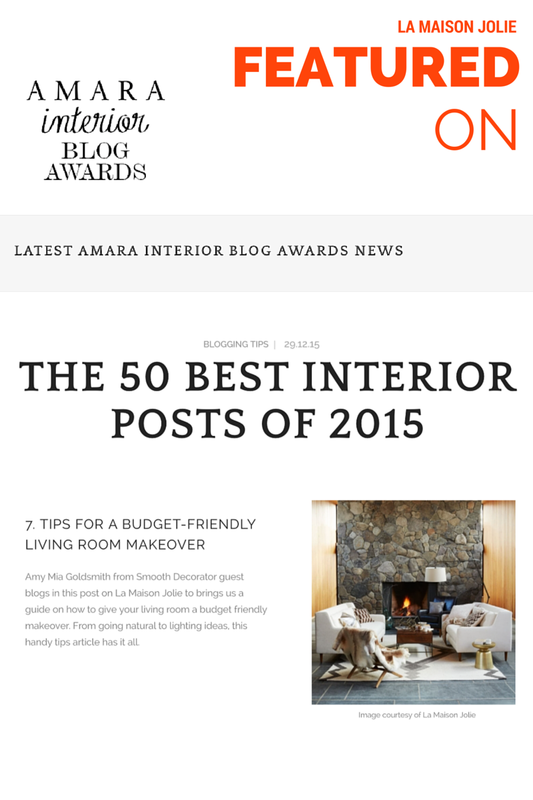 A Surprise Feature on 50 Best Interior Posts of 2015 by AMARA Interior Blog Awards! Absolutely thrilled to have La Maison Jolie featured in the round-up of 50 Best Interior Posts of 2015 by AMARA Interior Bog Awards! Guest post by Amy Mia Goldsmith on 'Tips For A Budget-Friendly Living Room Makeover' on our very own blog La Maison Jolie was featured as one of the best interior design posts of 2015! How awesome is that!!! Congratulations Amy! Read about it on www.interiorblogawards.com/50-best-interior-posts-2015 & also check out the other 49 awesome posts! Thank you so much for the feature AMARA Interiors! What a great start to 2016! Nice post....love your work.....thanks for sharing.